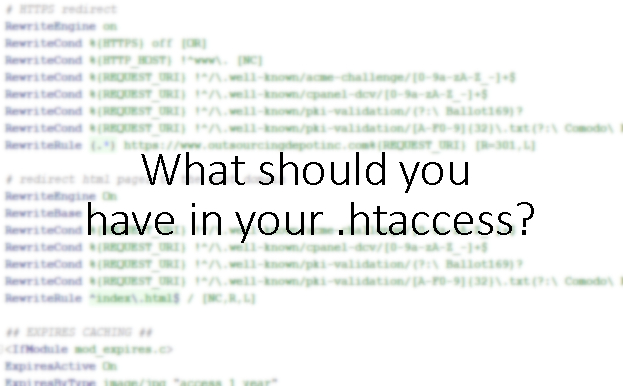 What should you have in your .htaccess? Whilst many people say that .htaccess can slow down your website (here is another interesting article on it), which is true, chances are that if you run a website on an Apache server you’ll have one, and you’ll use it, and frankly, the slow down is only a few milliseconds even for a huge .htaccess file. So, what do you include in it? Firstly, if your site uses HTTPS (which it should to rank higher in SEO rankings), you’ll want to force HTTPS across all pages. This snippet will force HTTPS on all pages of your site. This makes links a lot cleaner - simply refer to links as <a href="page"> instead of <a href="page.html">. Caching is also important for websites. I like to enable gzip on most of my sites, as well as set expiry headers for images and other website objects that are unlikely to change. You can enable gzip like so. Be sure to include or exclude files you want to compress. ExpiresByType application/x-font-ttf "access plus 2592000 seconds"
ExpiresByType application/x-font-truetype "access plus 2592000 seconds"
ExpiresByType application/x-font-opentype "access plus 2592000 seconds"
ExpiresByType application/x-font-woff "access plus 2592000 seconds"
ExpiresByType application/font-woff2 "access plus 2592000 seconds"
ExpiresByType application/vnd.ms-fontobject "access plus 2592000 seconds"
ExpiresByType application/font-sfnt "access plus 2592000 seconds"
Whilst the above way is longer, and you could cut down on lines by using mod_headers, I like to do it the above way as it makes it easier to change caching lengths are more readable. The above links to error pages under the errordocs folder. I like to separate error pages from the root directory. If you ever want to make a large change to your site, you can redirect users to a certain page, or even a different website entirely when the main one is under maintenance. This is also great if you are having issues on a new version of a Wordpress template, or are updating your online store. This will redirect everyone but your IP and 127.0.0.1 to that page. .htaccess is a great tool for those using Apache servers. It allows you to have so many options on configuring your server, and unless you are running a very basic site, is a must have. Hopefully these snippets will come in handy for your site!